This my dear friends is what I like to call - my homeschooling manual. If you do not have this book on your shelf, buy it now! It is one of those books that you will have a hard time putting down. You will not just read it through but you will turn to over and over for advice and help. Inside this huge 376 page book you will find encouragement, advice, curriculum suggestions, sample schedule for your day, books to read, and SO MUCH MORE! 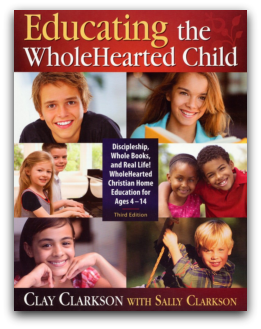 Clay and Sally Clarkson, the authors of Educating the WholeHearted Child, have 23 years of homeschool knowledge under their belts. They first wrote this book in 1994 and this is the brand new revised and expanded edition! Their simple and common sense approach leave you feeling equipped to take on the task that God has laid before you in training and raising your children. Let's face it, homeschooling is hard. It is not everyday that I wake up saying, "I can't wait to begin". I struggle and this book has been an uplifting and encouraging blessing to me! My own personal cheerleader telling me to keep pushing through and to not give up. What homeschooling parent doesn't need that!?!? One of the things I love the most were how many scripture references were given. There was so much emphasize on training our child's heart for Christ first and the learning will come. So, if you are looking for a secular book of training or curriculum - this is not the book for you. But for our homeschool, Christ will always be first! You can check out the table of contents and a sample chapter for free. Then, when you decide to purchase it for your homeschool library and I know you will - you can do so at Apologia Educational Ministries for only $22 + shipping! Apologia also offers many other resources for homeschoolers including bible, science and many more products. Gena Suarez, publisher of The Old Schoolhouse Magazine, said it perfectly. "This book is gold for the homeschool mama!" and we all know you can't put a price on gold! So, would our family purchase this book? Absolutely - I would even buy it as a gift for my friends. It is that awesome to me! Don't forget to check out what my fellow crewmates thought of Apologia's Educating the WholeHearted Child. **Disclaimer: I received a free membership in exchange for my review. The opinions here are my honest and true evaluation! I think this book is a must have too. I could read it over and over and still learn something new. Stopping by from the Crew.